Only 30 Seconds to Learn! Happy Salmon is the simple, fast-paced card game packed to the gills with high-fivin’, fin-flappin’ fun. Actions including the classic "High 5", the unifying "Pound It", the frantic "Switcheroo", and the delightful “Happy Salmon” will leave players doubled over in laughter. With so many mini-celebrations built into the play, it’s the happiest game ever! The Happy Salmon Blue expansion has arrived. It's the same fintastic game as before but with different color cards. This expansion can be played alone or with Happy Salmon Green to increase the maximum number of players from 6 to 12! At the same time, everyone calls out the action shown on their top card. When two players have a match, they celebrate by performing that action together, then discard their top card. Keep doing this. The first player to discard all their cards wins! Dubbed the spiritual successor of Happy Salmon, Funky Chicken replaces Happy Salmon’s celebrations with funky dance moves. You’ll be spinning in place, hip-bumping, swinging with your partner and, of course, doing the iconic “Funky Chicken”. When two players have a match, they frolic by performing that action together, then discard their top card. 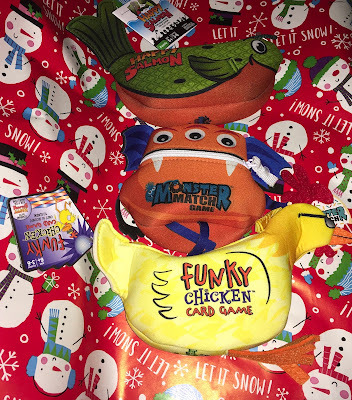 Play Funky Chicken by itself or combine it with the green Happy Salmon to create a fin-flapping, feather-flying, good time! ﻿Toy of the Year 2019 Finalist! Click on the seal to the right and please vote! In the town of Sprinkleton, monsters are running rampant and stealing all the donuts. We need your help! Monster Match is the screaming-fast game of catching cute, donut eating, monsters. Players roll the special "Monster Dice" and then race to find a monster that matches the dice rolled. How fast can you find a monster with 3 eyes…or 4 arms? With each monster worth different donut points, do you search for just any matching monster, or do you try to find the monster with the most donuts? But watch out! Go too fast, you might catch the wrong monsters and lose your donuts! The player with the most donut points wins! Cassandra's Review- get read for hours of fun without having to learn a ton of rules first. The perfect on the go games that can be packed and played at other people's houses during the holidays for even more family fun.